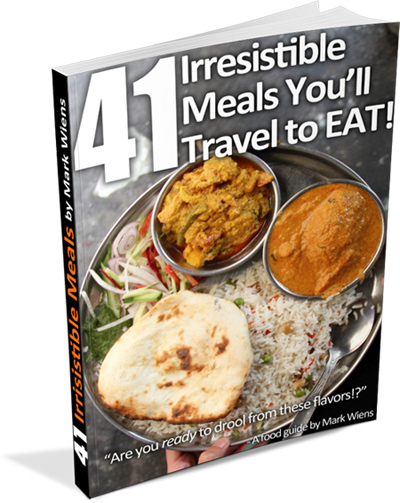 These meals will make you want to travel, just to eat! Prepare yourself to drool over these 41 meals, each featuring mouthwatering photos, details, and where you can eat it. 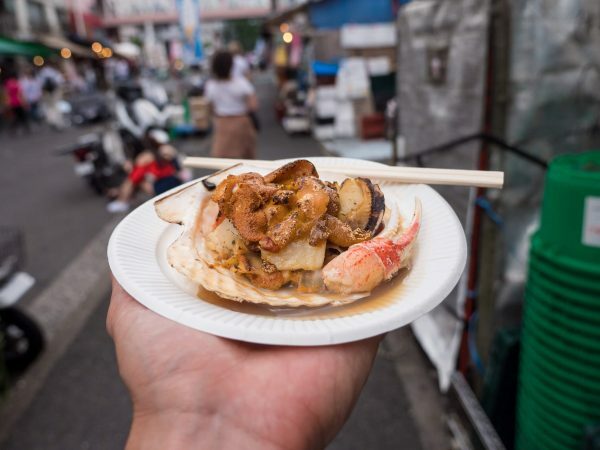 I've also included some of my personal travel eating tips and answered some of your top questions... like "Mark, how do you make money to travel?". You must love food as much as I do! Bangpoo (บางปู) is one of the closest places you can go from Bangkok to see the ocean. Although it’s not a swimming beach, you’ll the have the opportunity to feed seagulls and eat a delicious seafood meal on the end of the pier. 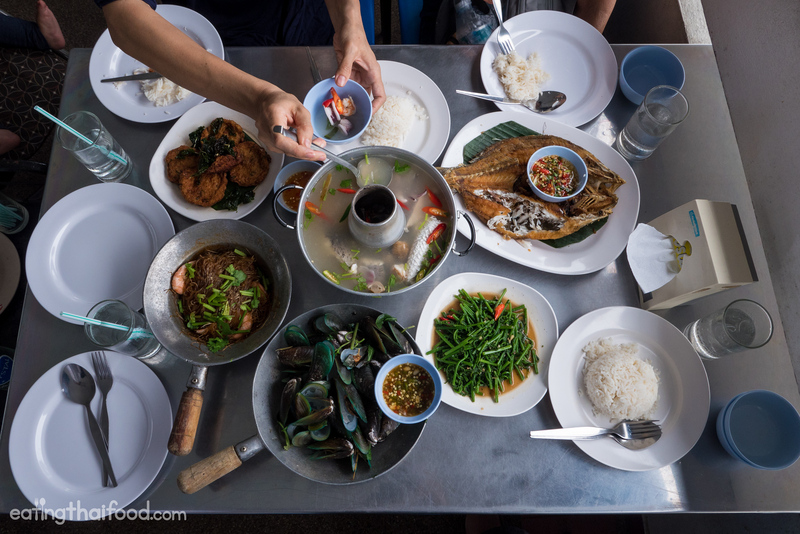 In this blog post I’m going to share with you all the details about taking a Bangkok day trip to Bangpoo (บางปู), and an amazing Thai seafood meal! If you have a few minutes, first press play to watch the video of this day trip to Bangpoo (บางปู). Let’s first talk where Bangpoo (บางปู) is. Bangkok is located along the Chao Phraya River, about 15 kilometers from where the river meets the Gulf of Thailand (possibly a little less as the bird flies). 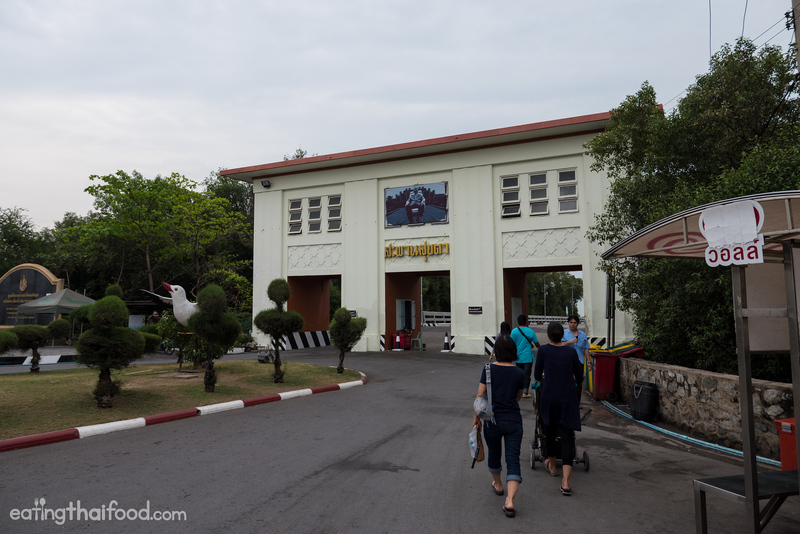 Bangpoo (บางปู) is about 30 km or so from Central Bangkok, located in Samut Prakan province. It’s a pier owned by the Thai Navy and it has an interesting retro 70’s feel to it. 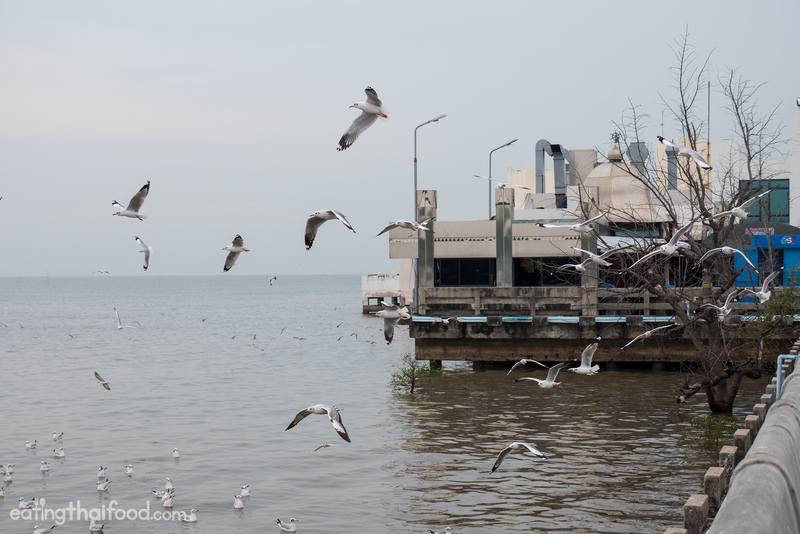 Many Thais take a Bangkok day trip to Bangpoo (บางปู) to do two things: feed and watch seagulls, and eat seafood. My wife and I jumped in the car, and since we went on the weekday, it didn’t take too long to get there — probably about 45 minutes straight down Sukhumvit Road from Central Bangkok. In addition to seafood, you’ll find everything at the market. However, we stopped off in Samut Prakan to quickly go to the seafood market just for fun. Enter your email and I’ll send you the best travel food content. 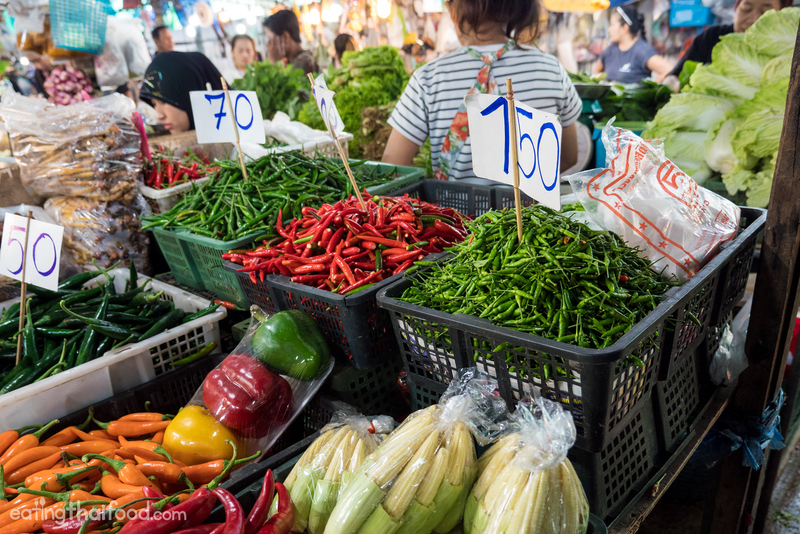 The big fresh wet market in downtown Samut Prakan is a great local market to visit, and even though it’s still so close to Bangkok, it has a small town feel and people selling tend to feel so much more warm and friendly than in Bangkok. 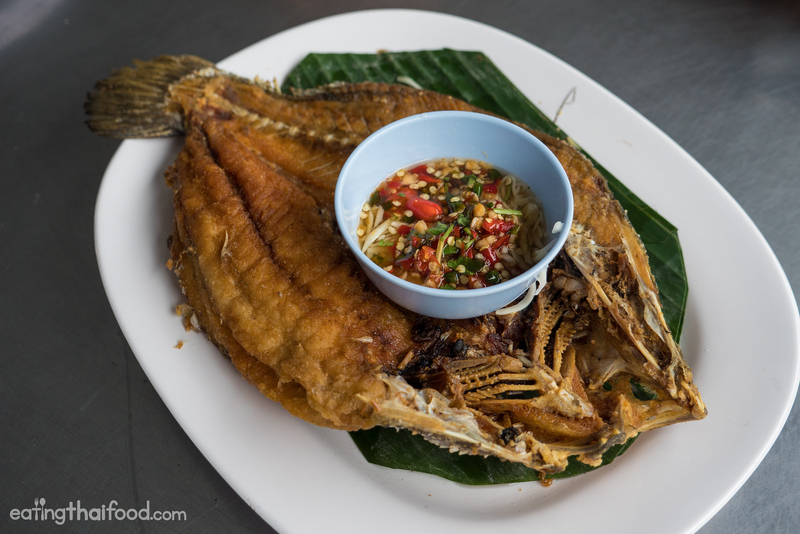 Anyway, if you’re taking a Bangkok day trip to Bangpoo (บางปู) and have some extra time, and before you’re too hungry, stop off at Samut Prakan Market for an hour. From the center of Samut Prakan, it was just about a 15 minute drive to get to Bangpoo (บางปู). 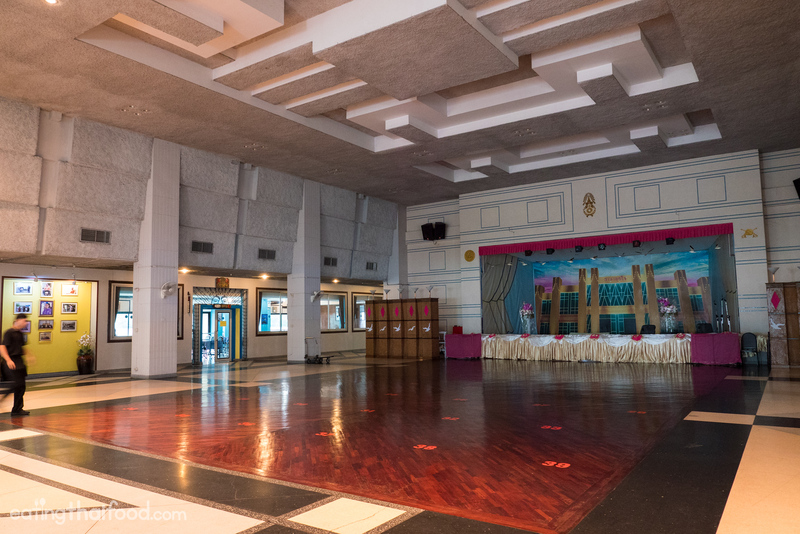 Again, it’s a Thai Navy compound, so it has an interesting feel to it, and it also has a pretty retro feel going for it as well. After parking your car (there’s plenty of parking especially on the weekdays), you then proceed to walk through the entrance way and on to the main pier. The pier is fully paved and it’s probably about 75 meters long or so (that’s a pure guess), and you’ll immediately see swarms of seagulls soaring over the sea, and swooping into rolling waves and the mangrove forest that lines the edge of the coast. You can feed the seagulls if you like! 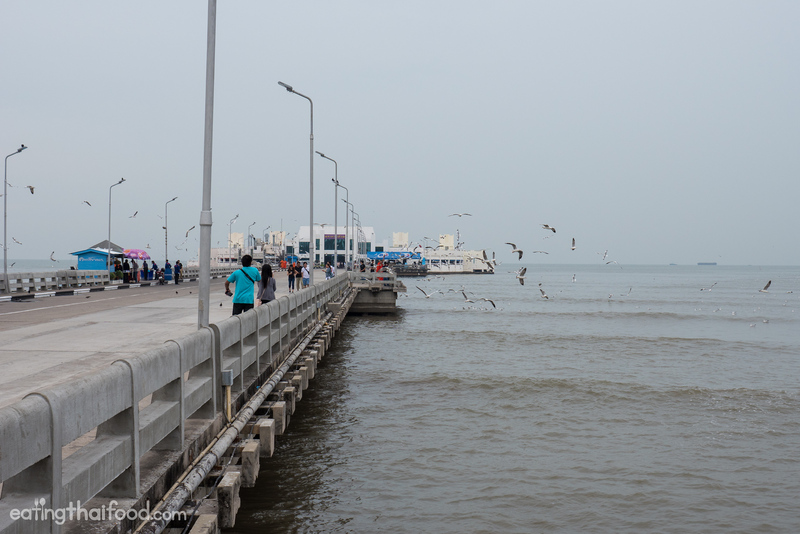 On the pier at Bangpoo (บางปู) you can buy some bird feed to feed the seagulls, and many people do. 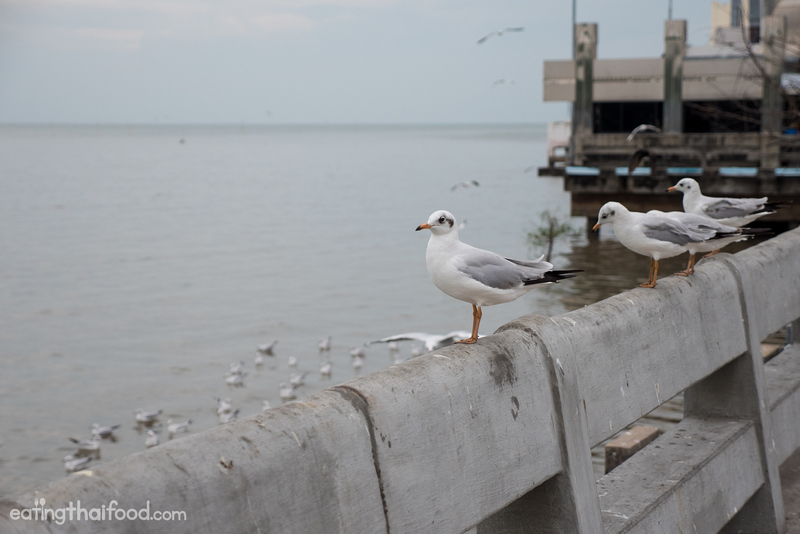 But I decided to skip the bird feeding and head straight to the end of the pier where you’ll find one of the best reasons to take a day trip to Bangpoo (บางปู): the seafood restaurant. The restaurant is pretty classy, it even has a ballroom! I think some people on the weekends rent it out for private events and even for weddings. But most of the restaurant is located on two wings off the ballroom, both of which are open air, and have a nice view of the sea and the seagulls that come swooping in. If you go on a good day when it’s not too hot, the sea-breeze will be amazing. Sala Suk Jai Restaurant (ร้านศาลาสุขใจ) serves just about all Thai seafood. You can choose from shrimp to crab to fish. Actually, I had wanted to order steamed crab, but since we arrived a little on the late side for lunch, the waitress mentioned that they had already sold out of crab for the day. At first I was a little disappointed, but then I realized that’s actually quite a sign of a good Thai seafood restaurant as they only serve what they get fresh and once they sell out, they are done. To begin the seafood meal we ordered a deep fried barramundi with fish sauce and served with green mango chili salad on the side. The fish was fried to a perfect golden brown so it was crispy and puffy on the edges, while fluffy on the inside. The green mango was a little more on the sweet side than the sour side, but it was pretty good. 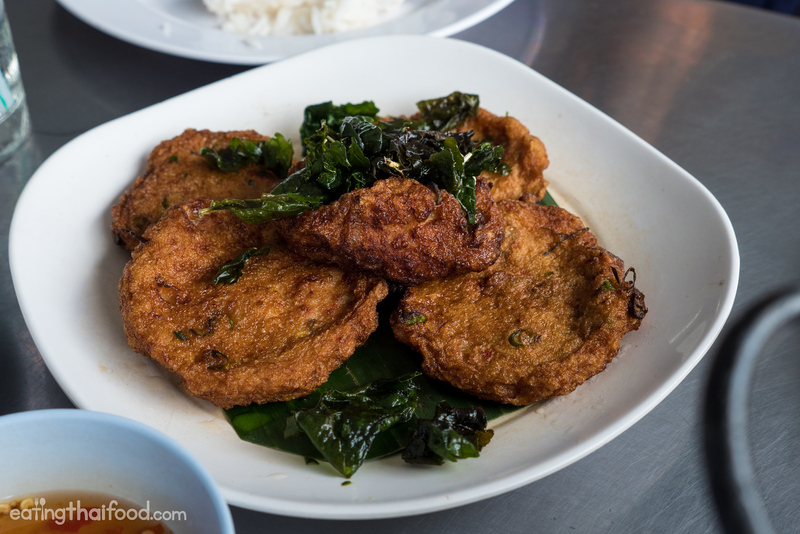 One of the dishes I really loved at Sala Suk Jai Restaurant (ร้านศาลาสุขใจ) was the fried fishcakes (tod man pla ทอดมันปลา). You could tell they were made fresh using all fish and curry paste and deep fried in patties. I also liked that they weren’t too overly smooth, but had some grainy and spongy texture to them. Great dish to order when you eat here. 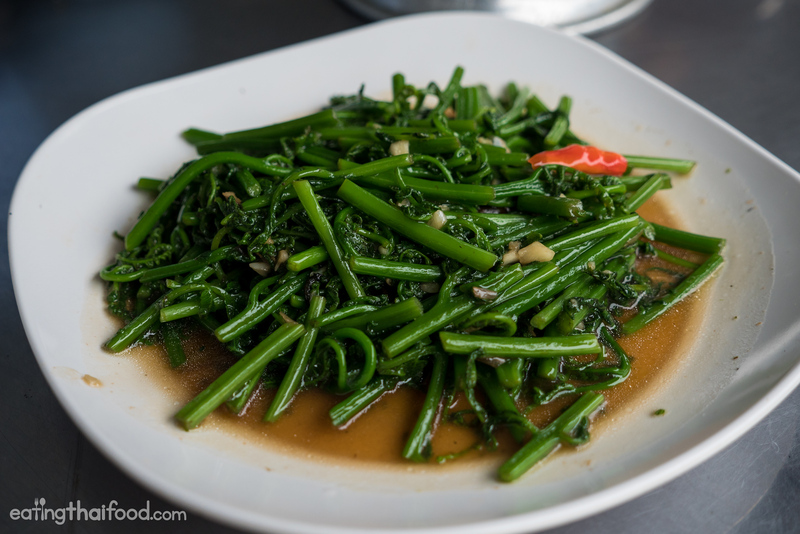 For vegetable we ordered fern stir fried with oyster sauce. I’m a huge fan of edible ferns, and this was simple, but excellent. 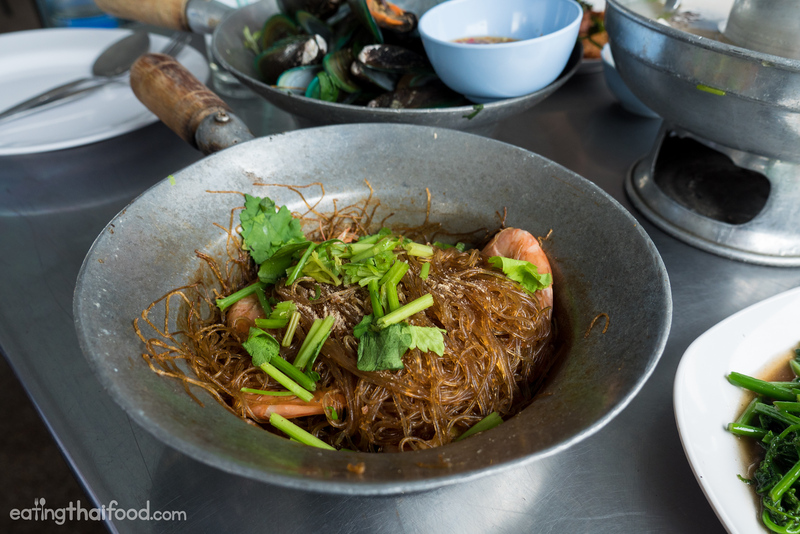 Goong ob woon sen (กุ้งอบวุ้นเส้น) is a common Thai dish of shrimp and mung bean noodles baked in a personal pot with pepper and cilantro roots and usually some pork fat. One of the best versions is at Somsak Boo Ob in Bangkok. The version here was alright, but it wasn’t amazing. It had good ingredients, but I think they could have bumped up the flavor of the cilantro roots. You won’t get big meaty New Zealand mussels here, but the mussels were local, small, but tasty. Some of them had a little bit of a tough texture, but I quite liked them. 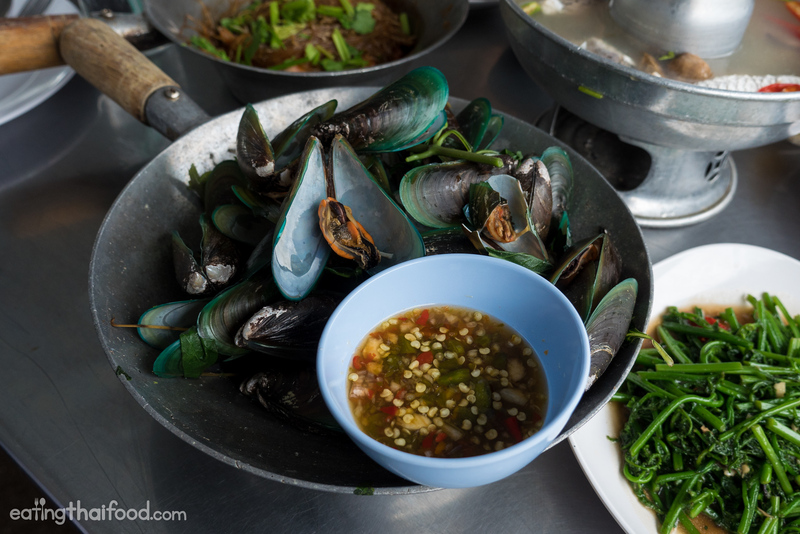 The mussels were again baked in a personal pot, with Thai sweet basil and lemongrass to give them some fragrance, and served with a chili dipping sauce. I saved the best dish at Sala Suk Jai Restaurant (ร้านศาลาสุขใจ) for last. Potaek (โป๊ะแตก) is another Thai soup, not quite the same as tom yum, but with a very pure seafood broth, very clean tasting, and very sour. The seafood was fresh, and the broth was absolutely outstanding. The potaek (โป๊ะแตก) was for sure my favorite dish of the meal. 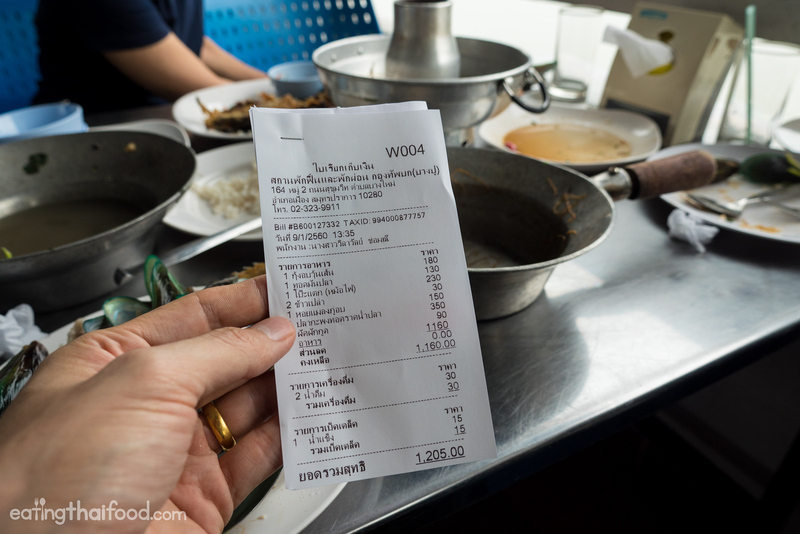 Total price for this entire Thai seafood meal at Sala Suk Jai Restaurant (ร้านศาลาสุขใจ) came to 1,205 THB ($34.40), and there were 4 of us who ate. Bangpoo (บางปู) is a Thai Navy pier that’s one of the closest places you can go from Bangkok to see the sea. It’s not a swimming beach, but it’s a great place to see and feed seagulls, and more importantly, to eat Thai seafood. At the end of the pier you’ll find a classic Thai seafood restaurant called Sala Suk Jai Restaurant (ร้านศาลาสุขใจ) that serves the full spectrum of fresh Thai seafood dishes. All the dishes were good, but I especially enjoyed the potaek (โป๊ะแตก) soup. Best Food, Travel Experiences, and Favorite Camera Gear in 2017! 139 comments. I'd love to hear from you! Awesome post! Pictures look amazing, as always! I don’t remember going here yet but next time I go back to Thailand with my family I’ll definition keep this place in mind. Thanks for sharing. That potaek looks spicy as hell! Don’t think I made it to Bangpoo during my two years in Thailand… Glad you did, though. Great job with the pictures as always. Thanks Chris, this is a nice relaxing place to visit. Wow, that was a lunch! That looks delicious, Mark!!!! Its Make me Hungry. I am love to eat thai food. I am love your post.It is very helpful . Love your Blog videos and recommendations! Looking forward to visiting bangkok again! Loved the recommended sites and various menu choices. Watch you all the time. That’s a great post! I love seafood, I think I must to visit this place. Thanks for sharing your experience! Not the biggest fan of seafood, but I can see how this would be a great destination for those who are … fascinating! 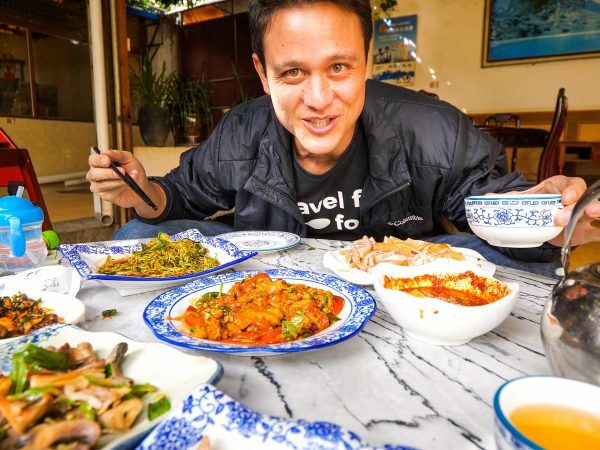 Hi Mark, wish you’d organize a package food tour in Thailand where you had experienced eating authentic Thai food. Foodie people like me needs you to lead the way. Been to Thailand twice already, and still had to taste authentic local food. 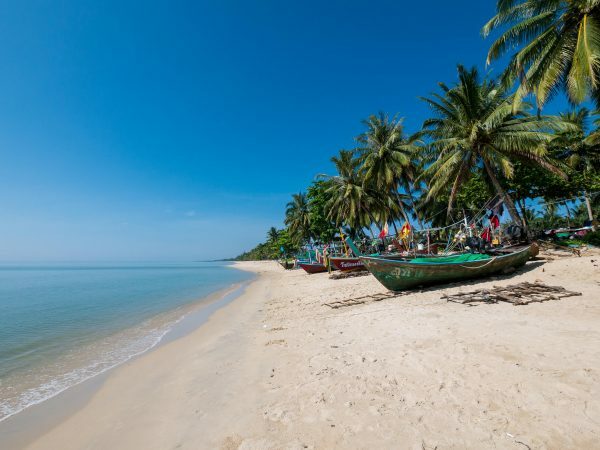 I would love to go visit the place where they make the best shrimp paste in Thailand, another place is here where one can have seafood and shellfish, and other interesting places you have been to. You’d be the best guide to lead a group around Thailand Mark. Please let me know if and when you do decide to do this. Hey Rosita, great to hear from you, thank you very much for your kind words. That’s a good idea for a tour through Thailand for food. I have some travels coming up, but I’ll definitely think about doing something like this. Thank you for the suggestion. feel fresh all of pictures, sea and foods~! always good job mark~!! Will be many more videos coming soon! Mark, we are such huge fans of your work and journey. I lived in Chiang Mai for five months as a student, and a lot of the exotic foods that you share with us took me back to the remarkable memories of sharing time with the locals while indulging in food that is, by far, a drastic improvement on what I was used to eating in my small town in western Massachusetts. Yum – I am ready to get back! Keep writing! Thai seagulls are cute! You made wonderful photos of the yummy Thai foods, Mark. I’m going to follow in your footsteps to Barcelona. Your videos are great! Thanks for this blog. Mouthwateringly tempting food. Just a simple question, my colleague is a vegetarian, what do you recommend she have (I thought the fern vegetables looked great, but it has oyster sauce so no longer a vegetarian meal). I can eat any of the dishes you mentioned, but I wish there was something an Indian vegetarian could order too. Wow! Very well captured, I am fan of your you-tube video. You always provide new stuff and i really like . Photos are looking great. What camera and lense are you using? Hi Mark. Yet another great video, and it was fun to look at the blog about it. My dream is to someday live near the sea so I could live on seafood, an occasional chicken, and some homegrown tomatoes and chilis. I’m curious if I could survive in Thailand on US$1000/month. Hey Mason, that’s an amazing dream… and I think it’s definitely possible to do so in Thailand on that budget, especially if you get into some rural areas of Southern Thailand, maybe in Trat, Nakhon Si Thammarat, or Surat Thani. Thank you so much Mark, as usual I enjoyed your excellent video blog very much. By the way baby is so cute. Its good to see your family in the trip. Thank you for your support Nui! Awesome to hear that Julia! Thank you for reading Karen. My family and I had just come back from Bangkok, went to Soei restaurant that you have recommended. Nice and worth the trip there. Too bad until now then I saw this video of Bangpoo seafood. Nevermind, will try next time when I visit Bangkok. Hey Jenice, glad you had a fun trip to Thailand. Sounds good, next time it will be waiting for you! Khap khun mak kwrap for all your videos and insight of wonderful Thailand. As an avid traveler myself, your videos have made me contemplate about making SE Asia my part time home with BKK as my hub (who woulda thunk it!) Congrats on the new addition to your family. Parenthood is a joyous part of everyday! ………….My condolences to Thai people everywhere. Rest easy King Bhumibol. Thank you very much KC Chin. SE Asia as your part time home is an excellent idea, and Bangkok is a wonderful base to go on trips from. Thank you! Thank you Hj. Abdul, really appreciate your support. Finally visiting the blog. Been watching th YouTube videos for a long time. You are my favorite YouTuber ! It’s like I’m right there with you ! I love your genuine authentistic love for food I am the same way with food. Hey Joe, huge thank you, really appreciate your support and kind words! Sounds like a great trip Mark! Bangpoo sounds interesting. Loved all the descriptions and pictures of the Thai food. I will check out the fish cakes and fried fish if I am able to go to Bangpoo. Dear Mark, Thank you very much for another great idea to eat near Bangkok ! Hi Wong, you’re welcome. Thank you for reading! Hi Patrick, great to hear from you and glad you enjoy traveling and Thai food so much. Home cooked Thai food is the best, but I’m also a huge fan of Indian food from all the regional varieties as well. Hope you’re doing well! Hi Ying & Mark, Awesome work as always – your work is inspirational and uplifting. Re-watched your Osaka trip last week and guess where we are heading in April ? Hope the little one is going well – bet he is growing like a weed now ! Hey Trevor and Michelle, thank you very much. Wow, great news, hope you have an amazing upcoming trip. Osaka is just fantastic. Thank you, so true, he’s growing so fast everyday! Thank you for introducing Bangpoo as a food destination. I always love my trips to Thailand, especially Bangkok for the food and golf. Definitely will make a trip to Bangpoo on my next visit. Btw, thanks for all your wo wonderous recommendations of places to visit..
Hey Debby, you’re welcome, thank you for reading and for your support. Hope you can visit Bangpoo next trip. I enjoy watching this video. Yes I have been to Bang poo and had lunch several times. Still love to see you and Ying and your sister enjoy your time there. Say Hi to Micah, it won’t be long to see him sit at the table with all of you (like father like son, I hope). Hi Malichat, great to hear that you’ve been to Bangpoo. Thank you, will say hello to them! Hi mark,i really enjoyed all of your videos.thanks for awesome videos,keep it up,i will always support your passion of food.lot of loves from malaysia.micah so cute also.such a blessing to have him.send my regards to ying.i wish you micah and ying to have a wonderful,delicious life. Hi Izwean, huge thank you, really appreciate your support! Amazing! The food looks totally delicious!! Thanks, Mark. Always a pleasure to hear from you. I hope to visit Thailand soon, once my daughter is done with High school. We’ll have a blast! She loves Thai food too. Hey Freda, thank you very much. That’s a great plan, greetings to you daughter as well! Congratulations! Nice to see your beautiful baby. You brighten my day each time I see your colorfull and informative video. It makes me want to take a food trip to Thailand. You’re the best Ambassador for Thailand. You promote it so good. Your the Best food blogger. Thank you so much Susan, really appreciate your support and kind words. Thank you for the wonderful video. It really makes me wanting to go there. One question how do we get there from Sukhmvit. Nearest train stop and then take a taxi there. Possible? Hey Selvi, thank you very much. At the moment you can take the BTS to Bearing station, and either a taxi, or a bus to Samut Prakan from there. However, they are working on the BTS which may soon run all the way to Samut Prakan town. Or also, you could consider renting a car in Thailand? Awesome, thank you Mark 🙂 Hope to see more tips from you from all places that you visit. Hi, Mark. Love following you, Ying and Micah. I have learned so much. Love your enthusiasm. Hope yo meet you one day. Cheers from Toronto! Thank you very much Dave, really appreciate it. Would be great to meet. wow! that is so yummy! Hopefully I will visit Bangkok one day. Thank you Nazri, hope you can visit Bangkok soon! I don’t understand why my previous comment was removed after waiting for moderation but anyway thanks for sharing the great videos and photos. I sure do enjoy watching the videos and reading the blogs. Hey James, thank you very much. Hope you’re doing well also! just the very best e-mails I have gotten today! thank you so much! we always look forward to your posts. give micah a hug for us! Huge thank you Rick, and awesome to hear that. Will do, and hope you’re doing well also! As I remembered potaek more like curry, isn’t it. Hey Lynn, it’s a bit more of a very thin and pure soup, very similar to tom yum nam sai. Nice day trip Mark, the foods looked delicious.I always love your travel story. Thank you Mark, for the beautiful video of day trip to Bangpoo. As I cannot travel anymore, your videos bring me to lovely places with authentic foods. I learn much about land and food through your videos. I love all your videos. Hope to see more videos soon. Hi Inge, great to hear from you, thank you very much, really appreciate your support. Your vlogs always inspiring me for try some new foods and I am start this already before watching your vlogs for me food is like just eat and finish . But now I am.interesting about what I eat and how it’s look like and what kind of taste is that I am starting like research on food all because of you sir . Thanks for inspiring me about food coz good food is everything for us . That is awesome to hear Faraz, makes me very happy. Thank you for your support. Great video Mark as always, now I’m hungry again. Mark, thanks for sharing. Watching your video’s always make me longing to travel to Thailand again. In the periode 1998-2008 I visited Thailand many times (in total 15 months) and enjoyed everything Thailand had to offer, from North to South and especially the delicious food. My health doesn’t allow me to travel long distances anymore but I still have my memories and thousands of photographs. Currently I’m following a great BBC documentary series Thailand, Earths Tropical Paradise I can recommend to everyone who loves Thailand. From a cold Netherlands, all my best wishes for you, Ying & Micah, be safe, be well, be happy. Hi Wim, great to hear from you, thank you for the kind message and your support. Glad you have such amazing memories of Thailand, the food and the culture. Thanks for the series recommendation as well, will check that out. Food looks so good. Nice to see your son and wife. Your videos are always a joy to watch ; fun, informative, and great quality. Hope you find time to visit Sydney one day ! Always a thumbs up ! Thank you very much Jim, I would love to visit Sydney! Heading to Bangkok on Tuesday, will have to take a road trip out there to visit this restaurant. Thanks for all you do, it is always helpful. Hey Carey, great to hear from you, sounds good. Have a great and safe trip! I like it. Could you please always write how to speek it in Thai like (tod man pla ทอดมันปลา ). How else can I order it, don’t wanna show the Thai language and wanna learn Thai speaking. Thanks , keep doing it. I like to eat Thai on the street since 1987. Thank you Volker, will try to add that. Great to hear that! Thank you very much Josephine, really appreciate it. Sounds good! Thank you very much Kate, really appreciate it! Good Sunday morning, Mark, Ying, and Micah. This was a very lovely vlog to watch. I always learn something new from you. The soup looked particularly delicious, almost like a hot pot, but I have seen Potek on the menus here in the US, just haven’t tried it yet. I’m sure nothing here could hold a candle to what you can get in Thailand, but hopefully someday I can travel. It’s always nice to see Ying and little man in the vlogs, but I was particularly pleasantly surprised to hear that you have a sister…and I’m guessing that’s her baby? She resembles you a lot. I always find it so interesting (family dynamics) how children are born looking like some family members instead of the parents. That is certainly the case with the six I had! Thank you for sharing that very informative and delicious looking vlog and looking forward to more! Best Regards from the U.S.
Hey Patricia, great to hear from you, thank you very much. 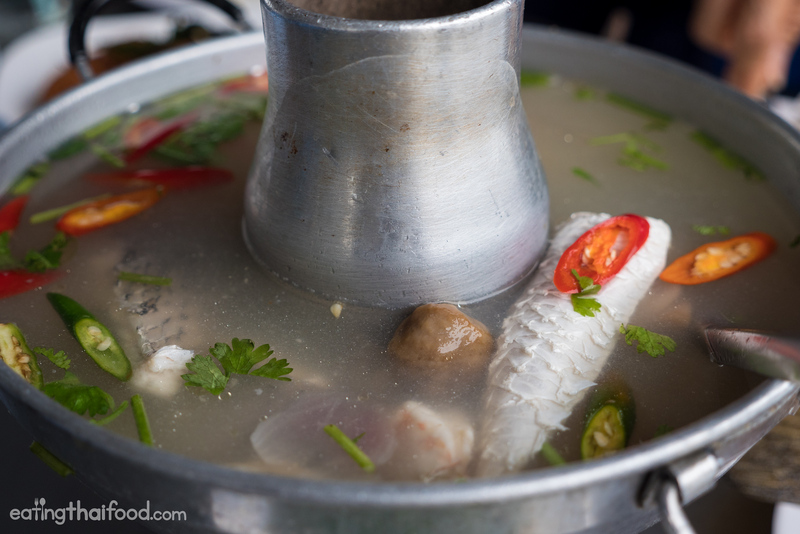 Potaek is a great alternative to tom yum, both of which can be excellent. Thank you very much, I have 1 sister, and she has 4 kids now, and that was her youngest. They came to visit for about 10 days to see Micah. That’s awesome that you have such a big family, that’s a huge blessing and joy! Hello Mark, another great post and video. I have enjoyed watching the video as much as watching your baby. He is such an adorable baby. Keep up the good work. Thank you very much Suli! That Potaek (โป๊ะแตก) sure looked heavenly, Mark! But is it more on the seafoody side or the tom-yummy side? Lol, I’m not even sure if my question made sense! Anyhoo, I haven’t seen the video yet as I’m so busy with college assignments but I’ll definitely check it out tomorrow. Hey Serena, haha, those sound like some words I would use. It’s more on the ton yummy side I think, very sour, but with a mellow fish tasting broth. Do well with your assignments! as always love to see you video ! Thanks for sharing, the kid is Q. Are you still in BKK? please look at my new website if you are interested. I would love to talk to you. I m looking for joint venture and you are a perfect one. Hey Jim, thank you very much. Ok will have a look. Thanks! I never been in Bangkok yet but the more i watch your videos the more i feel this is a place i need to discover. Hey Dandoha, awesome to hear that, hope you can visit Bangkok. You’re my inspiration, Mark! Your posts are super informative and helpful. I love Thailand and your videos always make me want to explore Thailand even more. I only been to Bangkok and Pattaya, and Bangpoo will be on my list. I wish you and your beautiful family all the best. Love from Bandung. ???????????? *sorry for my English. Hi Regina, thank you very much for your kind support. Bangpoo is a nice place to visit and the seafood is fantastic. Hoping to visit Bandung as well! I think i’d have tried the soup in 2014 i was in Bangkok and i try that soup in chatuchak market but i do not know the name it is quite the same.. A clear broth and a mushroom something like that.. And yess Mark it is very delicious, i don’t like fish to much but after i tried the soup i eat all the fish..
Hi Erwan, great to hear from you. Glad you enjoyed the soup even with fish in it. Thank you for your support, hope you’re doing well! Hi Mark thank you for sharing . Just for the information Bangpoo is a royel Thai army compound . And on Sunday start from noon they have ballroom dance open to public. Hi Virachai, oh is it Thai Royal army instead of Thai Navy? I will correct that. Thank you. Hi Mark, just watched your new vlog on seafood at Bangpoo. It really makes me hungry especially the soup and the mung bean noodle. Hope to see more interesting yummy food video from you soon. Thank you very much Kevin!